Other minor factors driving the low prices are the huge competition with a very large number of players looking to build their renewable energy portfolios in the Indian markets. International companies, private equity backed platforms, domestic conglomerates as well as major utilities are all fighting to get a slice of the pie. But INR 2.62/kWh (USD 4 cents/kWh) was not expected by anyone in their wildest dreams this year. Even a year ago when someone bid INR 5.1/kWh, they were thought to be crazy and that the project would fail for sure. But the critics failed to notice the fact that solar prices were being bid even lower in other places in the world. In the Middle East and Mexico prices of 3-4 cents/kWh was being seen routinely. It is expected that a new Saudi solar auction tender could see prices go as low as 2 cents. So India at INR 2.62 or 4 cents is nothing out of the world! 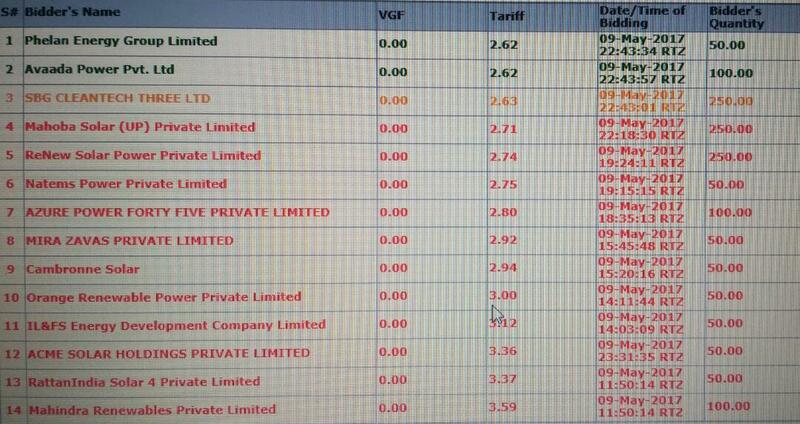 Also read, Another Solar Auction in India leads to low developer interest and reasonable tariffs. The INR 2.62 was bid by a South African group (Phelan) as well as Welspun Energy for building a solar plant in Rajasthan’s Bhadla solar park (Phase 3). There were other multiple bids below the 5 cents/kWh mark, which means that the bids were not irrational by the winners though they are risky in my view. Softbank just missed by 1 paisa. However, the Indian market faces some unique challenges which are not that acute in the other places of the world. One is the poor finances of the buying distribution utilities who do not have the money to pay back the solar developers in time. The other is the power grid which is one of the weakest in the world. With more solar and wind power entering the grid in the coming years, this problem will become larger. INR 2.62/kWh is truly a landmark price and announces solar as the king of the power sector in India displacing coal years in advance. New coal power plants cannot be built at less than INR 4/kWh and that too after years of construction and getting clearances from forest, land and environment departments. In contrast, a solar power plant can be put up in 3-6 months in deserts. My heart would be having strong palpitations if I was the owner of a thermal or a gas power plant without a PPA. This means the end of the coal power development in India. While the intermittency will allow some of these plants to get built, I would be selling my coal, thermal power and related equipment stocks as fast as possible. Also, read How Solar Industry Could See A Major Convulsive Shock At The End Of The Year. Hello Sir, I am Anil Gill from Distt.- Kaithal, Teh.-Kaithal, pin code-136027, State-Haryana(INDIA). Sir, I want to establish a project unit (@ 1mw) of Solar Power project of any Govt. authorised company (who is intrested in it ) on my land( about 12 acres one place and 7 acres on another) both located on Kaithal- Jind road, Kaithal(Haryana). These location are very close to 220 kv electricity power house which is known as 220kaithal power house who is under U.H.B.V.N(UTTAR HARYANA BIJLI VITRAN NIGAM). Firstly I was going to participate in solar power project construction directly but for it have very high cost and must be much knowledge of solar panel and energy that I have no because I am extremely new in this field so i thought to do work with a company recognised by govt. with giving my land to that company on lease or contract or any third way as possibility will be come sothat i can get knowledge of it with working design of company. So if you are interested in this project please contact me on my no. 9034388009 and email:- anilgill121@gmail.com. If you want to visit on sight you will be welcomed. Water and electricity also available for the proper starting of project.